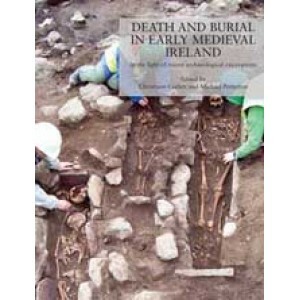 This publication is the second volume in the series ‘Research papers in Irish archaeology’. The series aims to highlight the results of recent excavations, on a thematic basis, and to facilitate the circulation, discussion and synthesis of this information. Death and Burial in Early Medieval Ireland is also an action of the INSTAR-funded Mapping Death project. It contains papers on over twenty recently excavated sites spread across the country, as well as a range of essays on current research topics and contributions by osteo-archaeologists and other specialists. The results of recent archaeological excavations have the potential to radically revise received wisdom and preconceptions of the past, and it is already clear that the existing text-books and syntheses could be substantially rewritten. This of course is what archaeological research is all about, and the sheer scale of new discoveries in recent years makes this a particularly exciting time to be an archaeologist in Ireland. This volume explores a type of non-ecclesiastical burial ground in Early Medieval Ireland for which very little was known previously. The unexpectedly high number of these sites uncovered recently, and the large scale of the excavations themselves, has provided an unprecedented level of new information that will transform our understanding of Early Christian Ireland, and challenge many preconceived ideas regarding this period. Edited by Christiaan Corlett and Michael Potterton, Death and Burial in Early Medieval Ireland features a foreword by Dr Elizabeth O’Brien and contributions by Christine Baker, Edel Bhreathnach, Thaddeus Breen, Laureen Buckley, Linda Clarke, Jennie Coughlan, Frank Coyne, Shane Delaney, James Eogan, Linda Fibiger, Jonny Geber, Vaughan Grimes, John Lehane, Cia McConway, Tiernan McGarry, Janet Montgomery, Charles Mount, Marta Muñiz Pérez, Tomás Ó Carragáin, Edmond O’Donovan, John Ó Néill, Tara O’Neill, Jerry O’Sullivan, Matt Seaver, Kate Taylor, Angela Wallace, Niamh Whitfield and Brendon Wilkins.